Easily take pans out of the oven without burning your hands with this pair of hot mill knit gloves! Made of 100% cotton, these gloves have a 2-ply, machine-knit shell for optimal comfort. They also boast nitrile blocks on both sides and a nitrile reinforced thumb to ensure a firm grip. Offering protection from temperatures up to 482 degrees Fahrenheit for 15 seconds (CE/EN 407, contact heat level 2), these gloves are the ideal choice for making your establishment a safer place to work! These oven mitts are great and work just as well as the competitor. I like that you can get multiple pairs of these for less that the other big brands. The non-slip nubs on the gloves are nice too and work pretty well but they aren't super tacky. We used to use "ove gloves" and we decided to give these a try due to the affordable price. Glad that we did because they are better. Great gloves for hot plates. Our kitchen staff love these gloves, saves them from burns!! Of cook uses them will cooking and the other workers use them for moving plates. Super helpful to avoid burns and even protect counters. Be careful if you accidentally touch hot water with them it will hold the heat on you hands! Big fan of these compared to more traditional oven mitts - you have much more control over handling hot objects. That said, it's not heat proof, so you still have to ensure you're putting the hot object down ASAP. Still manageable and better than the alternatives. good price, nice fit. We bought several pairs for each of our staff. They are washable. One thing, we noticed that after washing them, their ability to withstand heat is affected. Older pairs get hot if you hold hot pans too long. Very happy with these heat resistant gloves. They work very well and do a great job at handling large hot pans out of the oven. Double thumbs up! These work great! I use them everyday now! I prefer them over regular oven mits because you can get a better grip on things with these. The hot mill knit gloves work well for sub 400 degree temperatures. I felt that they were a bit "thin" in the material strength to stand up to high temp.. but they are great for low temp work. The "Hot Mill Knit Gloves" are one of the best random kitchen purchases I've made. The manufacturer is Cordova, item # 3830. These are so much better than oven mitts. You have full dexterity and they're actually quite comfortable and soft on the inside. The value on this is also amazing. There is another nearly identical product in looks from another company for twice the price. I can't speak to the qualitative difference but all I know is these gloves serve their purpose perfectly, no complaints for half the price of the other guy. I highly recommend getting yourself a pair of these. You won't regret it, especially for so cheap. Having a startup cafe, we needed all equipment for our cafe. I do not recommend this one for hot items. Your hands will still get burned since it doesn't shield it from any heat. It's just a glove with grips. Great pair of gloves for the kitchen. I have tried many glove types and these seem to hold up well! I certainly will these again. I was skeptical about these types of gloves, but turns out they work great! They are big enough that they fit both my husbands and my smaller hands. They give more control over silicone based mits and pot holders. And a good price too. Very satisfied. 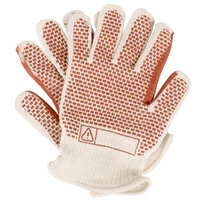 These gloves are great for yard work, in the kitchen! They are knit gloves. They don't get worn out easily nor do they melt and get "crispy" in the sun! So definitely a trust-worthy brand! They fit nice, comfortable, washable, good to throw on and grab something out of the oven. You can feel some heat after a few minutes. Would not recommend carrying something hot for too long. These are pretty good gloves for handling hot foods. They do get very hot in a shorter time than I expected so you have to be careful how long you hold something. Very versatile and machine washable. Perfection! Super cost effective, lightweight, and effective. I use them for all kinds of tasks, and they do the job just a well as other, much higher priced brands! I used one pair for 8 months before i needed to grab the 2nd pair in my busy cafe/bakery, used for loading the oven, pulling hot pans, etc. I didn't really notice it was time for a new pair- but now that i busted out the new ones I realize how much used I really got out of them. Great value. These gloves are nicely textured and fit my hands well. Because of the red pattern, they're also easy to find when you're in a hurry. Love hot hand gloves! I have small hands and large forearms so most mitten style hot pads don't fit my arms. These Gloves are a game changer! Even though they fingers are giant on my hand they fit well enough to work, I have never miss gripped a dish or pan. I do have to say that they are not nearly as cute as the only oven mittens I've over found that fit my arms, but I feel I can much more securely hold even the heaviest of lasagna pans! Do be cautioned though, these Gloves are not for holding really hot ceramic, cast iron, or glass for long periods of time. It's best to set the hot dish down within a minute or two. The heat will get through eventually! Totally love them and bought extra pairs for all of my sisters and their husbands! Only dropped one start because I wish they offered a slightly smaller size. These gloves fit well and are made well, can withstand a lot of use and are easy to wash. We use them for grabbing the hot vertical skewers when the meat is finished. Will buy again. These are so incredibly cheap and useful I don't know why they aren't as popular as the clumsier whole hand hot gloves. I use these anytime I bake, and often when I cook with cast iron pans. Obviously they aren't as insulated as the more expensive options, but I haven't had a problem with them getting too hot yet. The Hot Mill Knit Gloves work perfectly. Don't feel any heat from our large commercial oven, which is very powerful. Used to get so many burns before I tried these. Great for quick release grabs. Gloves keep hands safe for pulls from the oven. If you hold onto trays for a while you will feel the heat transfer but overall great for everyday kitchen use. These gloves are great! All my prepping staff and dishwasher dont get burn anymore when graving stuff out of our warmer and the hot frying pans. These are nice, high quality gloves that will hold up to heat very well thanks to the rubber and fabric combo. Good grip and a nice fit on average man. I've used these heat resistant gloves a thousand times in the kitchen from cast iron skillets to baking sheet pan s there comfortable and protect your hands from the heat very well. These are amazing. I don't know how I lived without these gloves before. Although they don't withstand the heat for long periods of time, they are great for gripping hot pans out of the oven and having access without a bulky glove. These gloves work okay but get hot more quickly than I expected. I used them for less time and lower heat than is listed and I burned my hand a little. Good price and they work well for lower heat or quick handling. These are the best oven mits you can buy. Because they have 5 fingers, they are more useful than traditional mits. I have used them in traditional bakeries and also in industrial factory baking. They last a long itme and can be washed, but only for a few times. That is the only downfall. I love these so much better than the OveGlove. These are roomy, and very easy to slip your hand in and out of, whereas the OveGlove is a much tighter fit that take a bit of effort to get on your hand. I use these for taking hot pyrex dishes out of the toaster oven, and they haven't failed me, yet! Perfect size that fits any hand, very durable and keeps your hand out of harms way. Easily cleanable by just throwing into your washer with some moderately soiled items. Worth the price no doubt. Love these! Such a great price and you can never have too many around (why do they always seem to disappear?!). They wash well, too. These hot mill knit gloves are great to use when operating an oven. While they are short and don't protect the forearm, they allow for maximum dexterity. Being able to control your fingers while gripping and moving hot trays is extremely useful! Would highly recommend for use in a shallow oven like ours. We compared these with the Ov Glove that was nearly 10x the price and these are very comparable. Keeping the hands safe while holding hot pans is a must for us. These are so well priced, its a no brainer! These gloves are terrific. Good for up to 500 degrees of heat yet they are not as bulky and motiong restricting as some other types I have owned. It is cleary a benefit to have all fingers free like these gloves and not the mitten type. good oven gloves. They work as they should and fit my large hands well, They have prevent a possible burn from happening, and they are cheaper and longer lasting than store bought gloves. These gloves do what they are supposed to do. I was able to hold a cast iron pan, that was at about 350 degrees, for a good 15 seconds before feeling the heat. These are size large gloves and they are pretty big. They fit my hands perfectly, but I am 6 feet and 1 inch tall, 270 pounds, just to give you and idea. I like gloves like this better than bulky mitts. My caution would be to pay attention to the size so you don't have to worry about exchanges. These are much easier to grip pans and handles than regular oven mitts. They are heat resistant, but I still do feel heat come through if I'm holding a pan fresh from the oven for more than 5-10 seconds or so. They are also a little big on me - I usually wear a medium glove, and these are more like large, even though they're marked as "one size fits most." These gloves are great for holding hot pans or tongs or ladles. We picked these up after the chef accidentally grabbed a hot spoon and he hasn't been burned since. These are nice but not as heat resistant as other brands you can buy. I do wish they came in a smaller size too as they're a little big for me. I still prefer these to regular oven mitts or towels though! These gloves have such a high level of functionality and provide so much more mobility over traditional oven mittens. They have a high amount of grip and do exactly what they need to! Nice and heat resistant. They do fit very large, at least on my hands (I normally wear a size medium glove). The large size made it a little difficult to get my fingers on a pan to grip it without touching the product, but as long as I grabbed the sides with more space it was fine. Overall happy with them. These gloves are extremely versatile and compared to competitor gloves, I prefer these. Great grip and no heat gets through. I've washed mine in the wash now a couple of times and they've held up great! Hot Mill Knit Gloves - 1 Pair is easy to use when taking a hot sheet pan out the oven. and is good when you are making hot caramel sauce keep your hand for the stem. Much better than traditional oven mitts because you have coverage on the back of had as well as hand. Fingers have free independent motion so grabbing things are easier too. These are the best glove I've found for removing cakes and cookies from the oven. They are sized large so even my 6'2'' hubby can use them. I like them better than the Ov' Gl*** that is so commonly sold. I have 3 sets of those but always look for these for removing baked goods. I'm actually really impressed with these. Because they are thin enough to have great dexterity, I was a bit skeptical on how well they would work. But it turns out they work fantastic. It makes it easy to quickly grab things out of the oven without contorting your wrist into an uncomfortable angle to do it. Great gloves. Very grippy and can take a good amount of heat before they get too warm. They're on the larger side, I normally wear large latex gloves and these are still a little roomy.